The GLFB is a fundraising charity. We don’t provide direct services ourselves, but we raise money for our nine local member charities and other grassroots organisations that help improve the lives of blind and partially sighted people across greater London. And while we do the fundraising, the charities can concentrate on doing what they do best – providing care and support. Our mission is to make London the best city in the world for blind and partially sighted people to live. There are more than 39,000 registered blind and partially sighted people living in London. But the true figure of people with a visual impairment is believed to be much higher. For many of these individuals, blindness brings isolation, vulnerability and lack of independence. Just venturing outside can be a traumatic experience. Activities that improve our quality of life – sport, the arts, keeping fit or just being able to visit friends and family – are often denied to them. And the sad fact is that unemployment among visually impaired adults of working age is more than 70 per cent, even though many have useful skills they are willing and able to contribute to society. We believe it doesn’t have to be this way and we are working with our member charities to change it. We fund community organisations run by dedicated experts who work tirelessly to make a difference to people’s lives. We look for those that have the most impact, and that would otherwise struggle to raise funds. They often have to make do with limited resources, yet their work is vital. have a chance to catch up with friends over lunch, or perhaps a game of bowls. Recreation activities for children – fun, confidence-building activities such as ice-skating or cricket, that are often out of bounds for families with a visually impaired child. Help with applying for statutory benefits – sometimes a little financial support can make all the difference. Employment and training – if you have a job, you have more self-respect and financial independence. If you would like further information on any aspect of our work then please do get in touch. Just before his death in 1921, newspaper magnate Sir Arthur Pearson organised a ‘Geranium Day’ appeal in London for blind and partially sighted people. 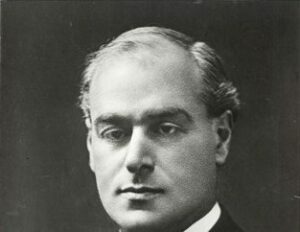 Left blinded by glaucoma, Sir Pearson used his personal experience of living with sight loss to raise awareness of the difficulties faced by visually impaired people. Pearson, founder of the Daily Express, proprietor of the Evening Standard, had already founded the national charity, St. Dunstan’s, in 1915 for soldiers blinded in war. It was the post-war poverty and low social spending of London. However, that inspired Pearson to found a new society in the capital using the Geranium Day funds. With his contacts and creativity, Pearson soon had a name, a symbol and the first royal patron, HRH Louise, the Princess Royal. Sir Pearson’s philanthropic work gave hope to thousands who shared his difficulties. In 1921, the Greater London Fund for the Blind began its work. Since 1921, the GLFB has been raising money and working hard with local blind welfare charities. We have had many successful events and many enthusiastic patrons. And as the new decade dawns, with so much more work to be done, we need to find new, exciting, and creative ways to raise funds.